We envision a world in which the choices we make in living our daily lives are guided by our 7th Unitarian Universalist principle: a respect for the interdependent web of all existence, of which we are a part. We believe that living out this principle means putting our highest priorities on developing peaceful and sustainable living conditions for all inhabitants of our planet, not only humans, but all living beings, and preserving the Earth, our one and only home, for future generations. Here are some of the things we are doing and hope to do to create an environmentally responsible community. We purchase our electricity from 100% wind power and provide opportunities for members to do so as well. In 2001, Penn Future honored the congregation as the Faith-Based Institution Purchaser of the Year. We serve fair-trade, organic coffee during Fellowship Hour and at other church events. Since 2002 we have had a policy of using non-disposable dishes and cups at church events (except for the annual picnic). We use recycled paper towels and toilet paper. We recycle all recyclable items on a regular basis. We have a bin to collect hard-to-recycle items such as batteries, cell phones, and ink cartridges. We have a worm composting bin in Unitarian House (which is in need of some tending). We have hired a cleaning company that has agreed to use green cleaning products. In order to improve the energy efficiency of our buildings, we use CFLs in our sanctuary where possible. Downstairs in Founders Hall we have recently converted to LED lighting, with financial support from individual members. We have a timed thermostat and set it to the lowest comfortable level. We did some work on the basement in the Unitarian House to make it more air tight. Future plans include LED lighting in the sanctuary and an on-demand hot water system in Unitarian House. We obtained and planted space in a local community garden and grew vegetables in front of the church for neighbors and friends to take freely, a small symbol of sharing and caring. We’ve helped the Northside Common Ministries construct new raised bed gardens so they can provide fresh produce to families served through their food bank. 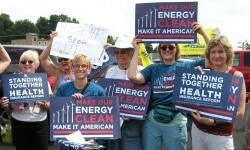 We held two screenings of the film, Carbon Nation, which was open to the public. One exciting plan in the works is an Eco Summer Camp for both church and community children. The church is a congregational member of the Pennsylvania chapter of Interfaith Power and Light, which is a faith-based group working to combat climate change. Some church members are individual members of this group. We had a speaker from West Virginia who explained the damage done by mountain top removal coal mining. In response, we wrote letters to our Congresspersons and we chose a group fighting mountaintop removal as our Share-the-Plate partner one quarter. 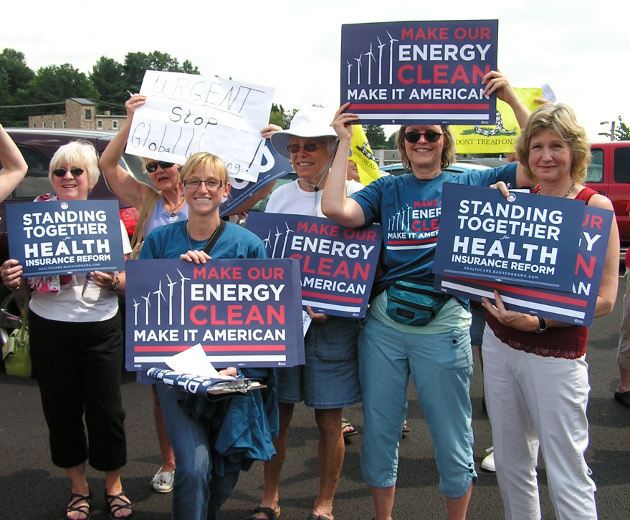 Interested members keep the community informed on other advocacy opportunities, such as joining with the Sierra Club to advocate for climate change legislation in Pennsylvania. We held an Earth Day service last year, which included a Blessing of the Bikes, which was attended by many from outside our church community. We have also had other worship services with an environmental theme and plan to continue to do so. Switch to renewable, green energy & support the church. If you’re already signed up, send the link to friends & family! Are your batteries dead? (Not figuratively. Literally.) They don’t go in recycle and shouldn’t be thrown in the trash. Green Sanctuary has a bin in Founders Hall for you to bring your old batteries and electronics. If you feel moved to create a more sustainable future with us, please contact the office to find out how you can get involved with the Green Team. We, the members of the Green Team of Allegheny Unitarian Universalist Church, covenant with one another and with the larger congregation to commit to taking personal and community actions to create a sustainable and healthy environment. Build awareness of and take actions to remedy environmental injustices.